CLASS 11 CHEMISTRY TAMIL MEDIUM STUDY MATERIAL- SUCCESS TUTION CENTRE. THIRUVARUR. 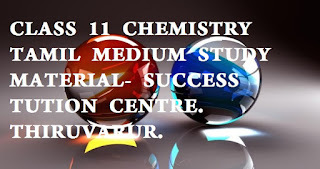 PLUS ONE - +1 - CLASS 11 CHEMISTRY TAMIL MEDIUM STUDY MATERIAL MODEL QUESTION PAPER, BLUEPRINT, CHEMISTRY NEW UPDATED PERIODIC TABLE & 10TH, +1, +2, PUBLIC TIMETABLE IN SINGLE SHEET. ALL IN ONE MATERIAL R.DHAKSHINA MOORTHY. M.SC., M.ED., M.PHIL., SUCCESS TUTION CENTRE. THIRUVARUR.